The Titles below contain information and FAQ's about Backyard Wild Birds. Squirrel Proof Bird Feeders - How to have the squirrel proof bird feeders that you want! 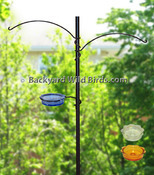 Solve "Squirrel Problems" & weather protection with the right designs of wild bird feeder equipment like squirrel stopper baffles and bird feeder poles. Bird Feeder Problems with Grackles, Blackbirds & Mourning Doves - Backyard Wild Bird feeding solutions of how to attract and feed desirable songbirds and yet limit access to undesirable birds and pests. 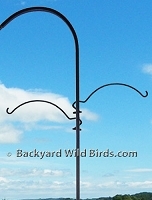 Deck Bird Feeder Poles Styles - Deck Bird Feeder Poles are useful to hang bird feeders off of a deck and give a close up view of backyard wild birds. There are many different styles of decks and are three basic mounting styles to choose from: railing clamp mount, screw mount and baluster mount. Attract Hummingbirds To Feeders - Learn how to attract Hummingbirds and avoid pests with the best in class Hummingbird feeders and ant guards. Squirrel Stopper Pro Assembly Instructions - View Squirrel Stopper Pole assembly pictures for the steps to put it together. Squirrel Proof Poles Assembly Instructions - Detailed Squirrel Proof Pole assembly steps with expanded parts view. Backyard Wild Birds - Additional Blogs - Birding FAQ's and ideas about how to attract, feed, and enjoy Backyard Wild Birds are explored here. Resources - Birding Links to Internet websites with invaluable Birding information and knowledge. Create your own Backyard habitat with great links to gardening and landscaping websites. Add A Link - Add your website to our Resource Links.